PosiCharge SVS200 can supply 320 Amps with maximum efficiency, making it ideal for hard working distribution centers and manufacturing facilities. 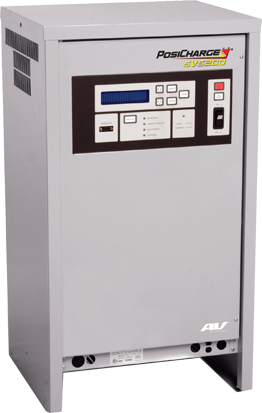 Built using sophisticated IGBT technology, the SVS200 is the high output charger of choice for customers looking to combine power with performance. SVS200 is the high-value charger that supplies safe, intelligent fast-charge power for a wide variety of industries. And like all PosiCharge chargers, the SVS200 works with a broad range of battery voltages and has the same data management and onboard intelligence.